I would like to thank Thermaltake for supplying the tested unit. 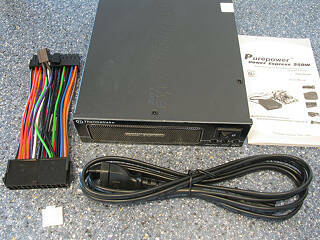 The Power Express is a video card power supply specifically designed for the needs of current high-end video cards. When you have an older PSU you may not be able to run Crossfire or SLI because the PSU can not supply enough power for the video cards to run stable. 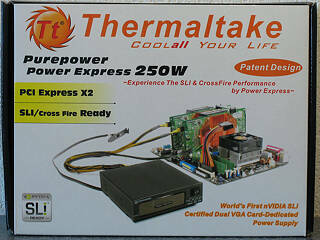 A solution is the Power Express which has 250W of power that are available to up to two video cards. Standard 5.25" design: fits into any 5.25" drive bay of all cases. Two 6-pin PCI-Express connectors support nVIDIA SLI technology. Works with main power supply: reduce the loading on current PSU and no need to upgrade current PSU while running dual card mode. 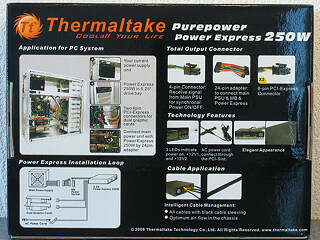 Keeps stable power input for graphic cards to maximize the overclock-ability & performance. Three LEDs display: red for power on, one green LED for 12V1, and another one for 12V2. Protections: Input Circuit, Over Power, Short-Circuit, Under Voltage, Over Voltage, and Over-temperature protection. Safety / EMI Approvals: CE and FCC certified. Voltage: +12V1 & +12V2 Max.